The Seattle Times reports that people are changing their shopping habits. It seems people are abandoning their cars in favor of—and this is really wacky—bikes and feet. 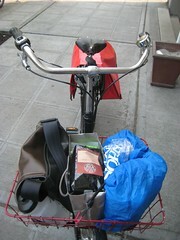 The article mentions Xtracyles and Bakfietsen as good grocery hauling machines. It’s great to see bikes in the mainstream media. Little by little people are realizing how simple it is to use bikes as transportation. This entry was posted in alternative transportation, bikes, extravehicular activities, news, seattle, xtracycle and tagged bikes, msm, seattle, transportation. Bookmark the permalink. I just uploaded a picture of my bike loaded up with painting gear. This is how I go around here in Austin painting people in public. Milk crates are great! Love your site. Sorry, folks. I forgot to provide the link to the page with the photo of my bike w/ milk crate. (n00b).